The UN climate conference in Bonn, Germany, has highlighted the importance of sub-national actors to translating commitment to action and meeting global climate goals. But as more non-state actors pledge action, how do we measure success? What is sustainability? What is green growth? To help answer these crucial questions, the Global Covenant of Mayors for Climate and Energy on Sunday announced a common framework for reporting greenhouse gas emission from sectors like transport, energy, waste and buildings. 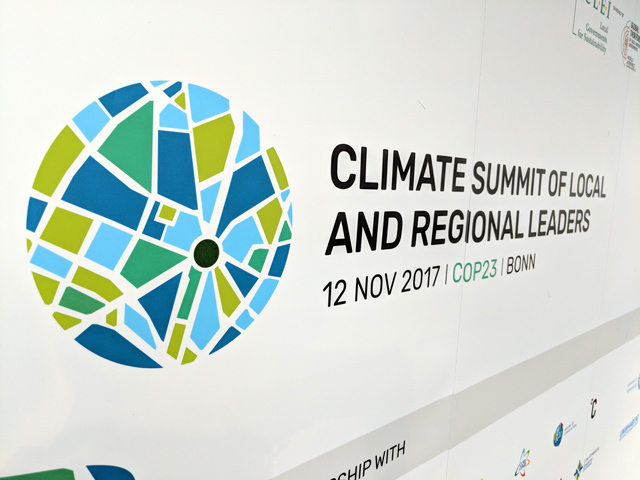 Seeing the value in protecting their citizens, stewarding their natural resources, and preparing their economies for the future, local governments and civil society groups are asking for a seat at the climate negotiating table. COP23 has elevated these voices more than any other climate summit to date. America’s Pledge launched a new report that for the first time aggregates all U.S. non-federal climate commitments. The Coalition for Urban Transitions launched the Urban Leadership Council. Other city networks like C40 and ICLEI are seemingly ever-present in the Bonn Zone. And the Fijian Presidency led the first-ever official dialogue at a climate meeting between Parties and non-Parties (that is, states and non-states) to the UN Framework Convention on Climate Change (UNFCCC). The Global Covenant is the world’s largest cities network with more than 7,400 cities and local governments as members, including other regional and global networks. The new common reporting framework is expected to help create more consistent and cross-comparable data. “This common reporting framework is valuable not only to better track cities’ contributions but to hold them accountable and help everyone learn what works best,” said WRI’s Wee Kean Fong, who was part of the Global Covenant’s technical working group. It is consistent with the Global Protocol for Community-Scale Greenhouse Gas Emission Inventories (GPC) and WRI’s effort to promote consistent and transparent greenhouse gas inventories for cities more broadly. The Covenant also hopes the framework will make it easier to finance city-level climate projects, which sometimes can be snared in national approval processes or derailed by unfavorable risk assessments when there is little data available on comparable efforts. Using the new framework, the Global Covenant announced new projections for the impact of its member commitments. If all Global Covenant cities commit to and achieve targets similar to those already established, they could eliminate nearly 1.3 billion tons of carbon dioxide equivalent per year by 2030, compared to a business-as-usual trajectory, roughly equivalent to the national emissions of Japan today. By 2050, the cumulative emissions avoided could reach more than 46 billion tons of carbon dioxide equivalent, according to analysis by WRI, roughly equal to the entire world’s emissions in 2010. The Global Covenant has members from all over the world, but especially strong membership in Europe after merging with the EU Covenant of Mayors last year. This accounting is the first to combine the commitments that came with that merger. Africa and Asia lag furthest behind in terms of coverage by the Covenant – though not necessarily in climate action, as China’s ambitious low-carbon cities program shows. 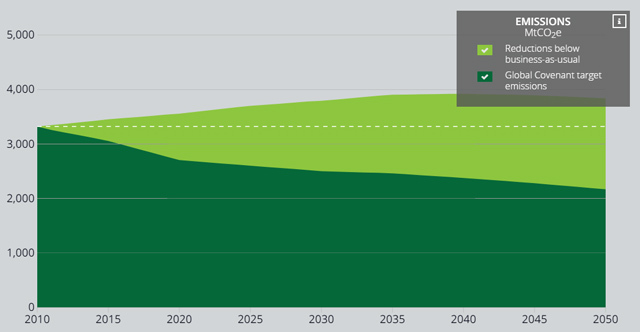 Future additions to the network and enhanced commitments could lead to greater gains. A period of consultation with cities and towns will begin early next year to refine the new approach. New members will be required to use the common reporting framework in 2018 while existing commitments will begin in 2019.